Can backers receive a book or perk early? At this time we are waiting to ship all books and perks after our September order deadline. Our original Kickstarter fulfillment date is October 2017. Is this a vegan cookbook? 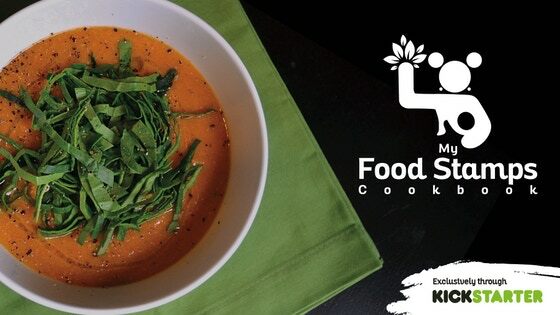 My Food Stamps Cookbook emphasizes sustainability and budget. That said, we find that animal fat and animal protein are expensive and inefficient sources of nutrients, and therefore we created a diet and lifestyle guide for maximizing plant sources of affordable food. Is this cookbook for poor people? This is a cookbook for humans who want to live happy fulfilled healthy lives regardless of income. My Food Stamps Cookbook is a diet lifestyle guide based on maximizing the smallest budgets for optimal health. All consumers benefit from our guidelines for saving money and resources, and our planet benefits as well! Can backers receive a book or perk early? Is this a vegan cookbook? Is this cookbook for poor people? I want to know when my reward is shipping. I am having trouble filling out my survey. I would like to make a change to my pledge. I would like help with preorders. I have a issue with my pledge finances. I have a question for the project creator. I have a question not listed here. I want a refund for my initial campaign pledge. I have a question about BackerKit.